Our goal is to help you gain a healthy and beautiful smile with reasonable cost and convenience. We will do everything possible to develop a friendly relationship with our patients and their families. We will help you learn good oral hygiene habits that will help keep your smile forever. Today the field of Orthodontics has been infused with some of the best science in health care, great strides have been made, previously only children had braces, in contrast, today, almost 20% of our patients are over 21 years old. The beneficial effects of correct jaw bone and teeth alignment is seen in today’s adults that previously were burdened by headaches, sore jaw muscles, clenching and gnashing, and night time grinding of teeth. Many people opt for Invisalign or SureSmile as it is less irritating and less bulky tan traditional braces. These clear braces can do many things, but not all procedures. We can fix under bites, overbites, cross bites, close spaces, and many other problems with Invisalign or SureSmile. 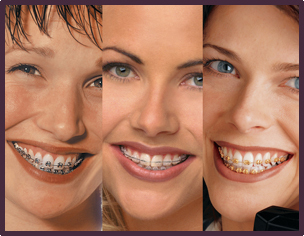 Orthodontics can have a positive health effect in more ways than a beautiful smile. When the teeth in one jaw are properly aligned to the teeth in the other jaw, the neuromuscular complex of the face, scalp, and neck can relax, not surprisingly peoples lives have been changed in beautiful and wonderful ways by eliminating: headaches, jaw pain, and excessive jaw joint and tooth wear. When teeth and jaws do not fit correctly, it is harder chew food properly and consequently reduced nutritional health. When teeth overlap improperly, it makes it more difficult to clean and hence become easily diseased by tooth decay or gum disease. If a patient has a retruded chin, or prominent lower jaw for example, surgical orthodontics can correct this. Finally, extra or missing teeth, unerupted teeth, and wisdom teeth can all be managed by an orthodontist. Through the coordinated services of your Family or Pediatric Dentist, Periodontist, Endodntist, Oral Surgeon, and our Orthodontic office, what could otherwise be an unhealthy bite can be corrected. Many, but not all of the procedures that we had to use full braces for in the past can now be treated by Invisalign or Sure Smile. Our office is committed to help you smile more self confidently and help you build more self esteem. Orthodontists use braces and other items to help guide the growth of developing children and adolescents, and in adults we are part of helping you eliminate jaw pain, grinding, and headaches. Copyright 2018 Fadem Orthodontics. All rights reserved.